Relative to its body size, the Orange-breasted Falcon appears to have the largest feet of any falcon. It also has an unusually large beak. In Central America, the Orange-breasted Falcon is absent everywhere south of Belize and Guatemala and found again only in Panama. Its absence from many countries that contain seemingly suitable habitat is one of the greatest mysteries of falcon and Neotropical bird conservation. 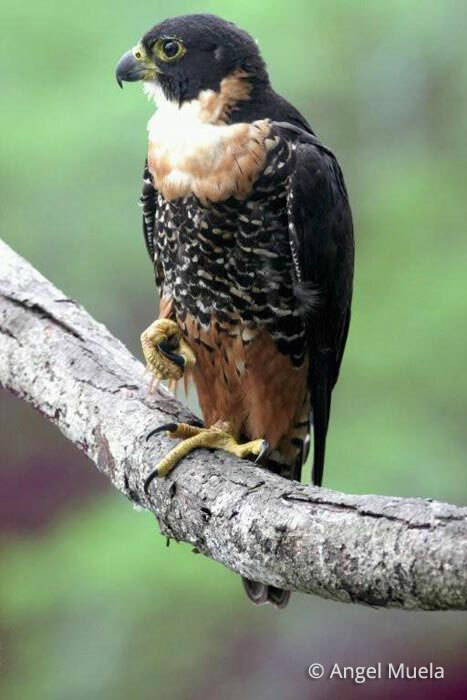 The Orange-breasted Falcon looks very similar to the smaller Bat Falcon. People often confuse the two species, making it hard for biologists to confirm reports of the much rarer Orange-breasted Falcon. Peregrine Fund Biologists have been studying the Orange-breasted Falcon since 1978, initially in Ecuador and Peru and then in Belize and Guatemala. Our biologists have worked very hard to find these falcons in Central America, searching on foot, by plane and by helicopter. 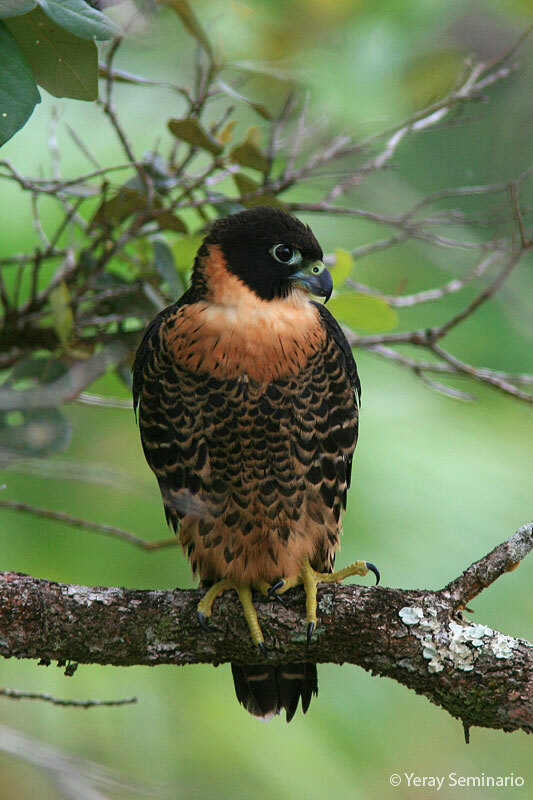 During one survey over a two-year period (1999-2000), they checked nearly 400 cliffs but never saw a single Orange-breasted Falcon in Honduras, Nicaragua, El Salvador, or Costa Rica. This confirmed that the small declining population in Belize and Guatemala is isolated by almost 1,000 miles from the larger population in South America. Today, we are focusing our efforts on studying the behavior, breeding and hunting habits, threats, and habitat requirements of the only known Orange-breasted Falcon population in northern Central America. 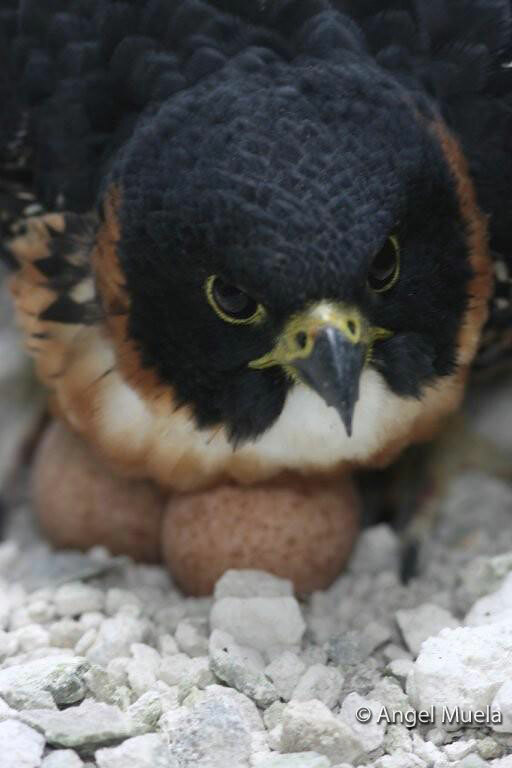 Because this rare falcon appears to be largely absent from much of Central America, we recognized the need to begin a captive-breeding and release program to help maintain genetic diversity and to prevent further decline. We conducted our first experimental release for this species in 2005. In 2006, we began a captive breeding program at our facilities in Sheridan, Wyoming. By 2012, 45 Orange-breasted Falcons had been produced in captivity and 30 released to the wild in Belize. The techniques used to release young Orange-breasted Falcons to the wild are similar to those used for releasing Aplomado Falcons and other birds of prey – with several important differences. The Orange-breasted Falcon chicks are hand-raised in small groups by a biologist. This is to help keep them tame while they are in the hack box, where the chicks become accustomed to their new surroundings, and for a short while after they are released to the wild. This is helpful because the chicks vary quite a bit in age when they arrive at the hack site. If the chicks are tame, biologists can release the older birds while still climbing up to the box in the evening to feed the younger birds that haven't yet flown for the first time. It is also helpful during the young birds' first flights, as they often end up grounded in the dense tropical forest. If they are tame, biologists can pick them and place them in a safe spot high off the ground and away from predators. But this tameness doesn't last. After a week or two of flying wild, these young falcons quickly grow wary of any potential predator – including humans! Nonetheless, even wild Orange-breasted Falcons are naturally relatively unafraid of humans, to their detriment. Another unique aspect of this falcon is the long period of time – about five months – that the juveniles depend on their parents for food. Other falcon species, such as the Peregrine Falcon and Aplomado Falcon, are dependent for about half that time. 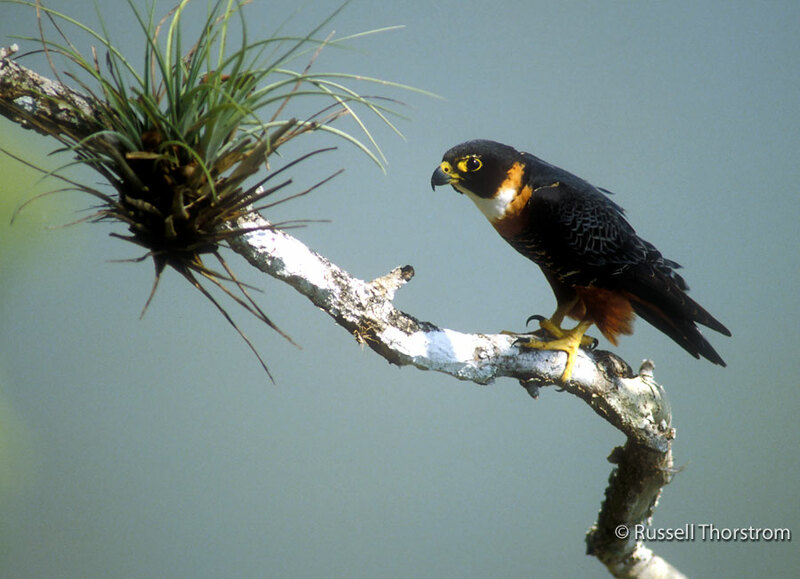 Though the young falcons are raised in Wyoming, they are released far from there in the country of Belize. When these young falcons are 20-40 days old, they are transported directly to Belize, thanks to the generous support of LightHawk, a flying service for conservation. Some of our released males have mated with wild females and produced eggs or young chicks. Orange-breasted Falcons have probably always been rare because of their specialized habitat: large cliffs where they nest and large areas of unbroken tropical forest where they live. Historically, their range may have been from southern Mexico to northern Argentina. Today, they occupy just 4% of their former range in Central America where a small population of fewer than 40 pairs persist in areas of Belize, Guatemala and Panama. Little is known about the species’ density in South America other that it is rare but widely dispersed geographically. Some biologists estimate that their total population may have never been more than a few thousand individuals – and there are even fewer today. 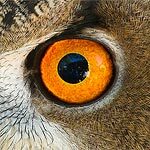 Like all birds of prey, Orange-breasted Falcons are visually oriented and their eyesight is eight times better than ours. How do we know this, since we cannot see through their eyes? We know because they have eight times the numbers of visual cells (rods and cones) in their retinas than we do. Even as young chicks, they pick up on small movements, such as a fly buzzing nearby, a rustle in the grass, or a passing bird flying overhead. Biologists who were caring for young falcons prior to their release in our restoration program noticed that the young birds were fascinated with a ceiling fan. They focused intently on it, moving their heads in sync with the rotating blades! Their lives depend on their ability to locate and identify prey flying high up in the sky or moving deftly across open areas in the forest canopy or rivers where these falcons hunt. Like other falcons, Orange-breasted Falcons are also extremely agile flyers. When they are young, they develop amazing flying skills through hard work and practice in what appears to us like playing games. Just as a cat "plays" with a toy mouse, these young falcons play to hone their future hunting skills. We have had the privilege of watching these young birds in action! In the first weeks after they fledge from the nest, the young falcons play “tag” by chasing one another, twisting, turning and diving after each other through the air. The wind makes a loud whooshing noise as they pass relatively low to the ground. Another popular game is "keep away" with sticks or pine cones. They fly close to a pine tree and grab a pine cone with their talons. All the while, other young falcons are in hot pursuit. The bird carrying the cone eventually drops it, a buddy catches it in midair, and the chase continues. Soon, they practice catching butterflies and large grasshoppers and eventually small migrating birds, such as swallows flying south over the forest canopy in the fall. Eventually, these falcons no longer need parental care and feeding. Though there were probably never lots of Orange-breasted Falcons, the species’ range in Central America today is limited to areas of Belize, Guatemala and Panama – a very small portion of its historic range. Biologists estimate the population in this region to be made up of only around 30 pairs. That isn't very many! By looking at records for this species in South America since 1970, biologists believe that this striking falcon's population is in trouble there, as well. Perhaps the biggest threat that these falcons face is loss or change in their habitat because of practices like logging, agriculture, and development. Another threat could also be the growing population of Black Vultures in the area. Black Vultures are scavengers that can eat just about anything. They are sometimes attracted to garbage dumps and tend to congregate there in large numbers, picking through the trash to find tasty morsels to eat. This means that Black Vultures can often be found in areas where humans are present. 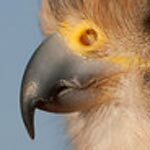 As people move closer and closer to Orange-breasted Falcon habitat, the vultures might be moving with them. Black Vultures might compete with these falcons for nesting cliffs and probably consume falcon eggs and young, too! The Orange-breasted Falcon female is nearly twice the size of her mate – a greater size difference than that of all other 39 falcon species. You may be wondering why there is such a large gap between the sexes. This adaptation enables the pair to select different-sized prey. The male takes smaller quarry, and the female captures larger prey. Relative to its overall body size, the female Orange-breasted Falcon has the largest feet of any falcon and also a particularly large beak. This heavy armament provides many advantages for the species. The female’s large size, huge feet and talons and beak help her manage social relations in the family group and defend the nest from predators. Like many other falcon species, Orange-breasted Falcons are primarily bird hunters. They prey on small- to medium-sized birds, particularly doves, parakeets, and swifts. However, they also take large insects and, during dusk and pre-dawn hours, bats. They are aerial hunters, so they take all of their prey while in flight. These falcons are extremely fast flyers and though no study has been done to measure their speed, biologists who have observed these birds in fast pursuit believe they could even be faster than the Peregrine Falcon, one of the fastest animals on Earth! Orange-breasted falcons use several different hunting strategies to capture their prey. The most often perch on high, exposed snags, which give them a great view over the tree canopy or adjacent valleys. Once prey is spotted, they might chase their quarry in direct pursuit over the canopy, sometimes making steep climbs into the air before falling in a short stoop onto their prey. They also may pursue their dinner in a very fast horizontal tail-chase or scan the sky for swifts and other high-flying birds and go up to meet them in the air. One biologist observed three instances where pairs hunted together after the same prey. Like most other falcons, Orange-breasted Falcons do not build their own nests. Instead, they often make small depressions in the substrate of ledges or in crevices of cliffs or sink holes. In Guatemala, biologists found a pair nesting on a Mayan temple in Tikal National Park, and they know of one instance of this species nesting in a palm tree. In South America, biologists have documented the falcons nesting under clumps of plants growing on large trees and in natural cavities of large trees, at the base of fronds of palm trees, and on cliffs. When she is ready, the female typically lays three relatively large reddish-brown eggs over a six-day period. 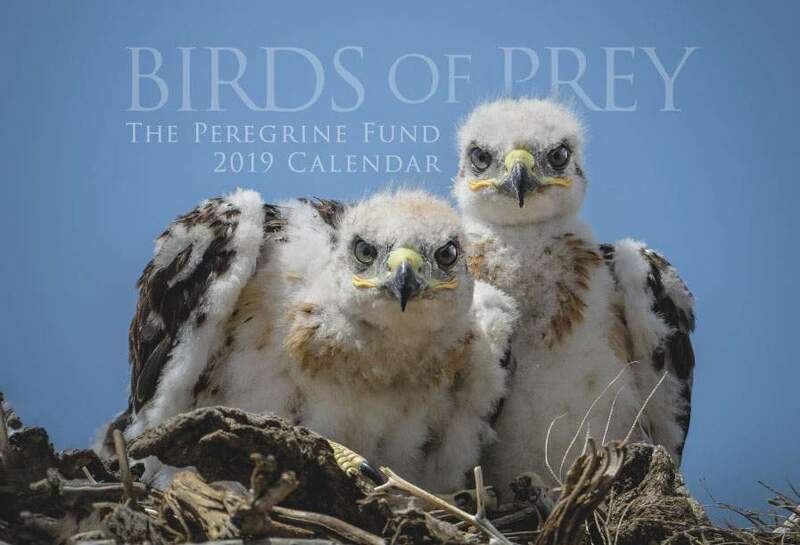 More than most other birds of prey, the female does most of the incubation for about 30 days and brooding of the chicks for about two weeks. While she is busy keeping the eggs and young at just the right temperature, the male works hard to provide all of her and the nestlings’ food. Should he perish, the chicks are not likely to survive, as the female seldom leaves the nest unprotected. This is hard work for the male and after the chicks hatch, he must be diligent in finding enough for his family to eat. Several times a day, he returns to the nest site with prey – often a bird that he has prepared by removing all the feathers, wings and legs. He and the female will often exchange food in mid-air and the female will carry it back to the nest where she will delicately feed tidbits to her young. At around 40 days after hatching, the young fly for the first time. However, they stay in their parents' territory for many months while they learn to hunt and live independently. During this important time in the young chicks' lives, the parents continue to bring them food. But now, instead of tearing off small pieces to feed to them, the parents bring them whole prey so the young birds learn to tear the meat and feed on their own. Orange-breasted Falcons usually reach breeding age at around 2-3 years old. The Peregrine Fund's World Center for Birds of Prey is a great place to get a close-up look at the Orange-breasted Falcon, one of the most colorful falcons in the world. On display at our Velma Morrison Interpretive Center, Orange-breasted falcons delight visitors with their bright orange breast, large yellow feet and slaty black backs. Visit us to learn all about this neotropical raptor and the rainforest habitat in which it lives.